Received my Avantree Audition headphones today and charged battery but headphones won't turn or off so are completely useless. Am experiencing ongoing hassles trying to contact Avantree about warrentry claim. Sorry to hear you are having issues with this item. Can you please contact our Customer Services so we can assist. I bought one of these 5 months ago and I have found them excellent. They fit over ears and keep out surrounding noise. The sound quality is very good, they are light to wear and I have used them for hours on Planes and trains etc. The battery life is incredible. I have just bought 2 more units as presents for Family members who are also delighted with them. Great value for money as well. No messy cables and having the ability to move about is simply fabulous. 10 out of 10. I liked them but they got broke six months after using them normally. Nice product.Paring is very easy to set up. Great sound quality. Distance on bluetooth is 10 to 12 meters blocked by several big walls, In open space 15 to 20 meters is common.I am using this at my working place and noise is blocked very well (without a noise cancelling system inside).This was one of my best buys. I am very happy about it. ( Excuse my bad english grammar, I am speaking dutch as my native language). good sound quality and easy to use. took 7days deliver to my house. Have been using these for about 3 months for my phone, tablet and PC. NFC-pairing works nicely for both connecting and DC on my phone. Easy to connect on tab and PC. Sound is much better than expected for this price range. Battery life is also good. Skipping tracks does actually work, both for Spotify, Play or any other music app that is active. Can't fast forward, but have little use for that. Skipping even works for Windows Media player on PC. 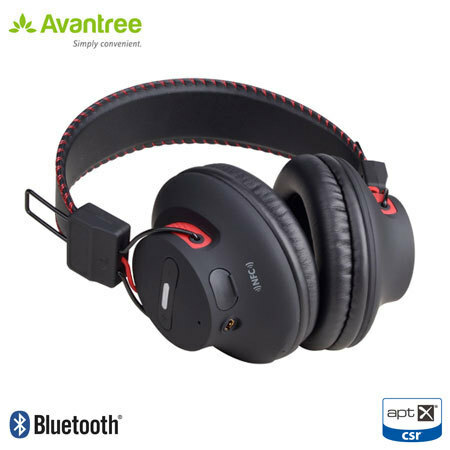 These are good headphones with a decent sound and quite comfortable. The only down side is that they do not have the ability to advance to the next track. other than that they are easy to pair up and work very well. For the price, this is a very nice headset and appears to work well with my iPad. However, when connected to my iMac which has 3 other bluetooth devices connected at the same time (keyboard, mouse, trackpad), the sound skips/jumps/clicks several times per music track. This may be down to my iMac though, which is a 2009 model. The other problem is that they are too small for my ears! I am male and I do not have extraordinarily large ears. They may be okay for women or children or for people with small ears however. If your ears are more than 5.5cm high, then there will be some compression of your ear, which can lead to discomfort. Got these last week, and I have to say I'm pleased. The higher range tones gets a bit muffled when playing really low, but when playing a bit higher, the sound is very good. In addition, they will probably go higher than is good for you if that's your perogative. The NFC works nicely with my Galaxy S3, but for other connections it's easy enough to just hold the main button until it blinks red and blue, and just select. The sound without the internal amplifier, when using a mini-jack, is also good. But there's not as much punch. I've gone about 48 hours between charges, using them on the bus and in bed at home. Given the price, this is a very very good buy! I have tested the headphones and i must say that im very pleased with the results. The sound quality on OPO (my phomne) together with poweramp and some little changes in equalisation is really good. Easy to pair and connect.Built in NFC is cool, but by turning Bluetooth on on OPO is just as fast. Some people say they are tight. For me they sit on my head just perfect. Not too tight, not too loose. I didn't experience any discomfort whatsoever. Built quality is very satisfying too. Nothing crazy but definitely worth the price. I prefer matte plastic to shiny. Theres no padding on the headband but can't say that lack of it makes them uncomfortable. I dont think that earmuffs are made of leather but they seem good enough quality. You get standard 3.5mm jack cable in the box so if the battery gets flat you can simply connect it and continue faping... Umm, listening to music. Battery life is pretty impressive. 40h listening and 20 days stand by. 40h of listening time is confirmed but im yet to test stand by time. Arrived within 2 days. Was very easy to set up. Sound quality excellent. I love using it. One complaint. I don't believe I have a particularly large head, however if I put the headphones on over my head the ear cups do not exactly reach my ears. It would have been perfect if the headphones were adjustable.